Officials said there were 71 people on board the US-Bangla Airlines plane from Dhaka when it crashed just east of the runway and skidded into a nearby football field. Rescuers had to cut apart the mangled and burned wreckage of the upturned aircraft to pull people out, some of whom were buried under the scattered debris. “Forty people died at the spot and nine died at two hospitals in Kathmandu,” police spokesman Manoj Neupane told AFP, adding another 22 were being treated in hospital, some in a critical condition. The cause of the crash was not immediately clear, but a statement from airport authorities said the plane was “out of control” as it came in to land. An airport source, who spoke on condition of anonymity, said there may have been confusion between air traffic control and the pilot over which runway the plane was meant to land on. Eyewitnesses said the plane crashed as it made a second approach towards the airport, bursting into flames after coming to a halt in a football pitch next to the runway. “It should have come straight but it went in the other direction,” said airport cleaner Sushil Chaudhary, who saw the crash. Nepal Army spokesman Gokul Bhandaree said seven of the victims survived the impact but later died of their injuries. Airline spokesman Kamrul Islam told AFP 33 of the passengers were Nepali, 32 were Bangladeshi, one was Chinese and one from the Maldives. Local media reported that many of the Nepali passengers were college students returning home for a holiday. The plane was a Canadian-made Bombardier Dash 8 Q400 turboprop, Mahbubur Rahman of Bangladesh’s civil aviation ministry told AFP. Other sources said the aircraft was 17 years old. “There might be technical problems on the aircraft. But it has to be probed before making a final statement,” Rahman told AFP. It is Nepal’s only international airport and experts say the surrounding Himalayan landscape makes it testing for pilots coming in to land. “The landing at Kathmandu because of the terrain is a little challenging,” said Gabriele Ascenzo, a Canadian pilot who runs aviation safety courses in Nepal. Today’s incident comes a day after a private plane carrying the daughter of a prominent Turkish businessman and her friends back from a hen party crashed in Iran, killing 11 passengers and crew, all of whom were women. 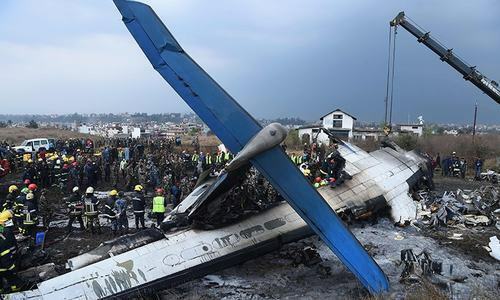 Nepal’s poor air safety record is largely blamed on inadequate maintenance, inexperienced pilots and substandard management, and its planes are banned from flying in European airspace. Accidents are common, hitting the impoverished country’s vital tourism industry. In early 2016, a Twin Otter turboprop aircraft slammed into a mountainside in Nepal killing all 23 people on board. Two days later, two pilots were killed when a small passenger plane crash-landed in the country’s hilly midwest. US-Bangla Airlines is a private carrier that launched in July 2014 with the motto “Fly Fast Fly Safe”, according to its website. The Dhaka-based airline made its first international flight in May 2016 to Kathmandu, and has since expanded with routes to South Asia, the Middle East and Southeast Asia. In 2015, one of its planes overshot the runway on landing at Saidpur in northwest Bangladesh. There were no reports of injuries.